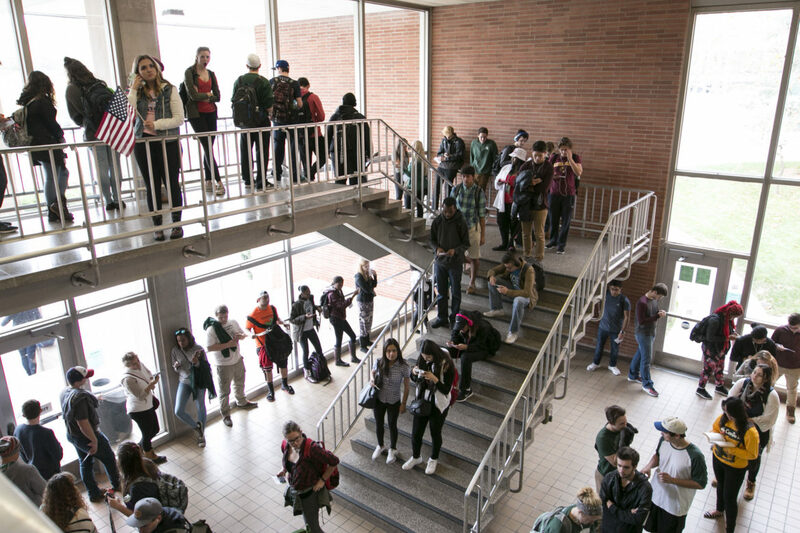 Lines fill the stairs as students wait anxiously to cast their vote Presidential Election on Nov. 8, 2016 at the IM West Building in East Lansing, Michigan. Leanne Pregizer was eligible to register to vote for the 2012 election, but chose not to because she didn’t know how to go about it. In 2016, a friend told her about Turbovote, a nonprofit website that helps people register to vote, update registration or request an absentee ballot. “The site was really easy to use, and they laid out the steps really well,” said Pregizer, Michigan State University law student . Online efforts like Turbovote, along with heavy voter registration efforts by campus groups, helped contribute to a spike in voter turnout and voter registration in East Lansing, local elections officials say. The number of people who registered to vote in East Lansing tripled, from 2,500 in 2012 to 7,500 in 2016, according to the East Lansing city clerk’s office. On the campus of Michigan State, voter turnout was also impressive, East Lansing City Clerk Marie Wicks said. In Precinct one, which is the campus’ Brody Neighborhood, nearly 77 percent of registered voters showed up to the polls. Precinct 12, the MSU Union Building, saw 64 percent of registered voters turn out. Precinct 13 and 14, at IM Sports East, had a 80 percent and 72 percent turnout, respectively. And Precinct 15, IM Sports West, had 1,804 registered voters in and out the polling place — nearly 70 percent of registered voters. It took some students at IM West two hours to get through the line to vote. Voters waited up to two hours to cast a ballot on Election Day at Michigan State University's IM West building. The East Lansing city clerk received a flood of voter registrations by mail leading up to the 2016 presidential election. The city had 7,500 new voter registrations in 2016, three times what the city saw four years earlier. Thousands of fill the office East Lansign City Clerk Marie Wicks after Election Day. Turbovote, a service supported in part by ASMSU, potentially had an impact on voter turnout. Turbovote sidesteps the normal process for Michigan residents to register to vote, allowing potential new voters to register using an online portal. The service then mails completed voter registration forms with a postage-paid envelope to those individuals, who need only mail them to their local clerk. Wicks, East Lansing’s clerk, said she saw high interest from younger voters in this election during the primaries, spurred in part by Vermont Sen. Bernie Sanders in the Democratic primary. She said Republican Donald Trump, too, inspired a segment of voters to get out and vote. And student groups worked hard to canvass campus to sign students up to vote, Wicks said. Student groups and the clerk’s office didn’t want to see a repeat of the 2015 city council elections, when only 26 campus voters turned out to cast a ballot. The MSU College Democrats conducted voter registration at various MSU events and throughout campus, making it almost impossible for students to walk to class without being asked if they had registered to vote. “They were out there every single day not only pushing voter registration, but talking to people about why it’s important to register to vote and then go out and vote,” said Bryn Williams, a Michigan State student and former community liaison at ASMSU, MSU’s undergraduate student government. Jacob Herbert is a journalism major with a concentration in sports reporting at Michigan State University. He has strong experience as an editor and multimedia journalist. One day he hopes to cover the NHL for a major news organization. Spartan Newsroom spoke with Bryn Williams when working on a story about how voter registration in East Lansing had doubled from 2012 to 2016. During the discussion, he talked a lot about the struggle that he getting students registered to vote and how we can overcome them.